Heather Pierson is an award-­winning multi-instrumentalist, singer/songwriter, and performer. From New Orleans-­style jazz and blues to rousing Americana and poignant folk narratives, Heather’s live performances, both solo and with her acoustic trio (Davy Sturtevant on strings/cornet and Shawn Nadeau on bass), feature her virtuosity on piano, her bell-­tone vocals, and her commanding yet playful stage presence while wielding a tenor banjo, melodica, ukulele, or acoustic guitar. Listen to any and all of her songs. After enjoying modest success with the release of several solo records (Make It Mine in 2010; The Open Road in 2012; The Hard Work of Living in 2013; Motherless Child in 2014), Heather burst upon the national folk scene in 2015 with her trio. 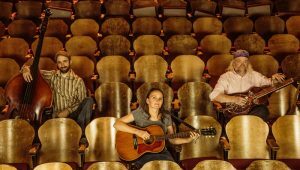 The Heather Pierson Acoustic Trio features Shawn Nadeau on upright bass and Davy Sturtevant on, as Heather often puts it from stage, “everything else” -­‐ guitar, mandolin, dobro, fiddle, cornet. Originally hailing from Erie, PA, Davy Sturtevant is a veteran touring artist, producer, engineer, songwriter, and performer who now makes his home in Lovell, ME. Armed with a gorgeous tenor voice and a mighty arsenal of instruments ranging from dobro to fiddle to cornet that come to life in his capable hands, Davy is at once a witty, thoughtful, and engaging stage presence. New Hampshire native Shawn Nadeau brings a rock solid thump and nearly two decades of performing experience to the trio, informed by a wide spectrum of unique rhythmic and melodic sensibilities ranging from rockabilly to reggae to jazz. 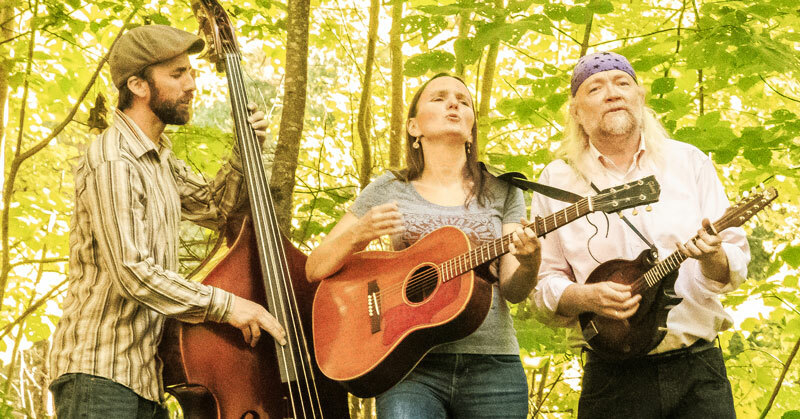 In their able hands, these three veteran musicians have catapulted Heather’s live performances of her deep well of Americana originals -­‐ folk, jazz, blues -­‐ with intricate instrumental arrangements and stirring three-­‐part vocal harmonies. The trio’s debut EP, Still She Will Fly, was released in May 2015. Its title track was the #2 single on the Folk radio charts for the year in 2015, and three other songs were also in the Top 100 singles on Folk radio in 2015. The trio’s full-­‐length debut, Singin’, releases on June 30, 2017, the tenth release on Heather’s own record label, Vessel Recordings. Throughout her colorful career, her eclectic skill set continues to propel her onto concert hall stages and into barrooms, coffeehouses, resort hotels, living rooms, and churches. Her nearly non-­‐stop performance schedule (with over 200 shows a year) speaks of her tireless work ethic and endless devotion to her crafts. Defying genre and classification and yet fully embracing all musical styles, Heather is an artist who speaks the language of music in as many dialects as her abilities will allow. Her life’s work, she says, is to share her love of music and of life with others – one song, one heart, one mind at a time.